There is an element of darkness following the practitioners of both Roman games and e-sports: The dungeons of Coliseum (wherein gladiators resided when not being present at the arena) and the shaded windows of an Internet Café, the inside of which pulsates randomly from the shifting of perspectives and scenes displayed on computer screens. The gymnasia of Ancient Greece, in contrast, were relatively open spaces with little or no roofs. This architectonic detour might be seen as if it doesn’t support the overall thesis of the present investigation, since for instance locker rooms inside arenas of regular sport seldom have windows. Also, the fierce fights between gladiators went on in the open. It is rather that stale and bleak darkness of incarceration, than the mere lack of light, which is alluded to here. In the case of gladiators, the case might be clearer, while gamers still have the opportunity to leave the shaded venues of e-sport competitions. The incarceration in the case of e-sport more concerns a widespread notion of how the tantalizing light from the screen captivates youth and binds them to chairs for hours. The investigative context is a comparison between Ancient Roman games and e-sport, which is presented in order to discuss the purported vices of e-sport, in relation to the virtues of sport. 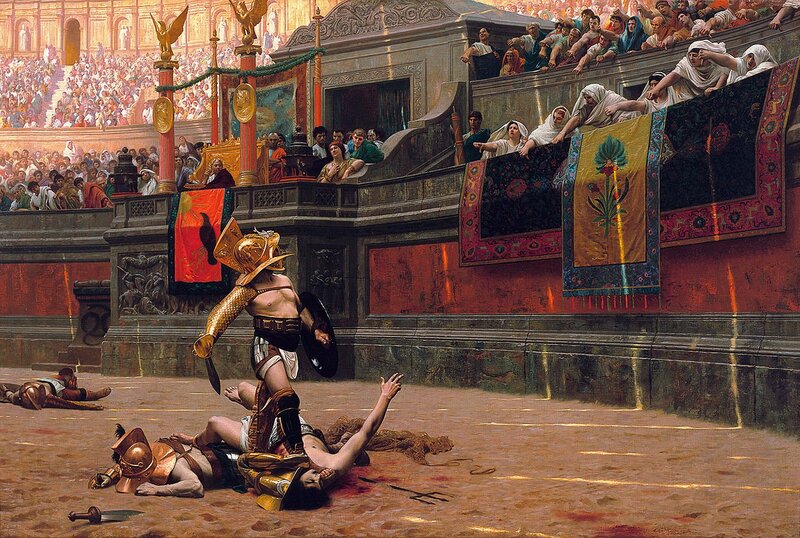 Also behold the first hand-control (albeit analog) in history in the picture above: the raising or lowering of thumbs of those outside the space of the contest finally decided the outcome of the Gladiatorial combat (click for enlarged image in new window/tab). Previous Post Loyalty in sport: who to support if your team is not in the weekend’s footy finals Next Post Håller du på med ett integrationsprojekt eller idrottar du bara?